Spending time with someone who already fishes is the easiest way to learn to fish. In fact, most anglers learned to fish from a friend or family member. So, if that's an option do take advantage of it. Most anglers enjoy passing on their passion and wisdom. For those who don't have that option, there are plenty of how-to videos, articles and books that will have you fishing in no time. You can get started on the Recreational Boating and Fishing Foundation website. It's an excellent source of general fishing information that contains helpful videos and practical advice on everything from selecting bait to cleaning your catch. Below we've compiled a list of getting started topics that should have you fishing in no time. Just click on a topic to get started. One of the easiest and strongest fishing knots for tying a hook to your line is a clinch knot. To ties this knot simply pass the tag end of your fishing line or leader line through the eye of the fishing hook. Make sure you have at least 6 inches of length on the tag end. Wrap the tag end of the line around the standing end five or six times. Moisten and pull both the tag end and standing end so that line tightens up against the eye of the hook. Trim the tag end. Check out complete step-by-step instructions for tying a clinch knot. Before you start fishing you should adjust your reel’s “drag” to the appropriate tension. The drag mechanism is designed to create friction so that a fish can pull line from your reel but with the right amount of difficulty. If the drag is too light the fish will easily pull line from the reel without getting tired. If the drag is too tight the fish may break the line because of too much tension. 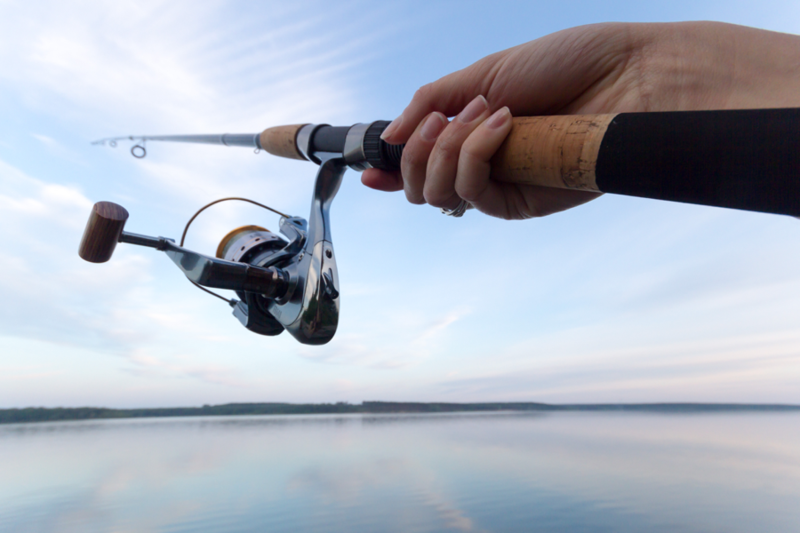 The easiest way to set the drag on a spinning reel or spin-cast reel is to first test it by using your hand to pull on your line directly above the reel. Tighten the drag on your spinning wheel by turning the front drag adjustment button a few clicks to the right if the line pulls out too easily. If it’s too tight, loosen the drag by turning the crank a few clicks to the left. Closed face spin-cast models usually have a top set roller drag adjustment mechanism. To set the drag on bait-caster reel follows the same principals as setting drag on conventional reels. The only difference is the location of the drag adjustment mechanism. On most bait-caster reels the drag mechanism is star-shaped and located next to the reel. Like the other reels, turn right to tighten the drag and left to loosen it. Find complete step-by-step instructions from this online guide. Worms, nightcrawlers, leeches and certain grubs are common and effective natural baits for catching sunfish, bass and many other species. To bait a hook with a nightcrawler or worm, push the hook through the side of the worm once or twice as you thread it onto the hook. When finished, most of the hook should be concealed and small portion of the worm should be left dangling. When fishing without a bobber a good rule of thumb is to wait and feel the weight of the fish before setting the hook. If the fish is cautious and just tapping your bait lightly it is best to wait. Let the fish take the bait, and then pull back on the rod quickly after you feel its weight. When fishing with a bobber it is best to wait until your bobber is pulled nearly or completely underwater or when you feel a good tug on your fishing line or when your bobber starts moving sideways. It is a good idea to reel in slack and keep your line tight. This helps you to feel the fish bite and makes for a more efficient hook set. Learn more by viewing the online guide. Though fishing with live bait beneath a bobber is an incredibly effective way to catch sunfish, crappies and even walleye, artificial lures that are constantly cast and retrieved have many advantages over bait-and-bobber rigs. That’s because they cover much more water, make noises that lure fish and can be fished at multiple depths. There are six basic types of artificial lures. They are the jig, plastic worm, spinner, spoon, plug and fly. To learn more about each, download our guide. Landing your catch can be quick and easy or long and hard depending on the size of the fish. Small fish can be reeled-in with ease. Larger fish that take out line and put a big bow in your rod require more time and patience. The best advice for reeling in big fish is that “when it pulls you don’t,” meaning when the fish is swimming away from the boat let your reel’s drag put pressure on the fish. A fish will usually roll into its side when it is done fighting and ready to be landed. Watch this video to see how it's done. A landing net is a good thing to have if you want to catch larger fish or fish with sharp teeth. A net allows you to lift the fish out of the water without putting stress on your line, which can easily break if the fish makes quick jerky moves. A net also allows you to get the fish safely in a boat or on a dock so that the hook can be removed. Typically, it is best to place the fishing net in the water and lead the fish into the net head first. If the fish sees the net and reverses course wait until the fish tires and try again. While you don’t want to stab the net at the fish you do want to be a little stealthy. If you want to eat your catch you may want fillet it, which is a common way to remove unwanted bones, scales and the like before cooking. This works best with an actual fillet knife. To fillet a fish, lay it on its side on a flat surface. Cut the fish behind its gills and pectoral fin, but only to the rib cage. Neither scaling nor removing the head is necessary. Turn the blade toward the tail and cut along the top of the ribs using the fish's backbone to guide you. Turn the fish over and repeat. Next, insert the knife blade close to the rib bones and slice the entire rib section of each fillet away. Then, with the skin side down, insert the knife blade about a 1/2-inch from the tail. Gripping this tail part firmly, put the blade between the skin and the meat at an angle. Using a little pressure and a sawing motion, cut against - not through - the skin. The fillet will be removed from the skin. 5Wash each fillet in cold water. Pat dry with a clean cloth or paper towel. The fillets are ready to cook or freeze. To see how this is done, read the online guide.